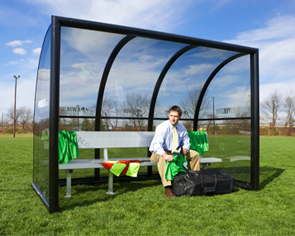 The Elite Referee Shelter is the perfect spot for the coach or referee to take a breather. Lightly gray tinted polycarbonate panels provide some shade and protection from the sun. Black powder-coated curved frame design gives off a sleek, modern vibe. The 9' bench is made of lightweight, weather resistant aluminum and connects to the shelter frame. Store equipment or gear on the rear mounted shelf that extends through the entire length of the bench. Optional wheel kit includes four swivel wheels and a dolly to help lift the shelter in order to attach the wheels. Wheels are to be used only as an aid in transporting the shelter. This shelter must be anchored into the ground using the four in-ground anchors supplied.